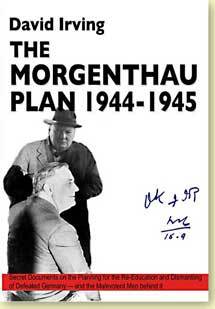 In the summer of 1944 the U.S. Treasury Secretary Henry R. Morgenthau, Jr. and Assistant Secretary Harry Dexter White devised the Morgenthau Plan, more formally known as the Treasury Plan for the Treatment of Germany. Morgenthau was outraged by the Nazi Holocaust, details of which were just becoming known in Washington DC, and seemed to be looking for revenge. He visited the battlefields in France that August. General Dwight D. Eisenhower, the Supreme Allied Commander, urged him to punish all Germany. Morgenthau then flew to London for talks with Mr Winston Churchill, the British prime minister, and his advisers, and they met again in Quebec. If adopted, the Morgenthau Plan would have led to the death by starvation and pestilence of ten million Germans in the first two years after the war ended, in addition to the one million who had perished in the saturation bombing and the three million killed in the enforced expulsion from Germany’s eastern territories. Both Roosevelt and Churchill unthinkingly initialled the Plan, as these documents show. While important elements of the Morgenthau Plan including the not-so-subtle “re-education” of the Germans by their own refugees and the dismantling of their heavy industry to bolster British exports were indeed secretly put into effect in the punitive Directive 1067 which the U.S. Joint Chiefs of Staff issued to Eisenhower, the more controversial elements of the Plan, including Morgenthau’s proposed ‘lynch law’ - orders to liquidate entire classes of suspected Nazi war criminals upon simple identification - and the instruction to leave the German nation to ‘stew in its own juice,’ were not formally implemented. But it was a close-run thing.